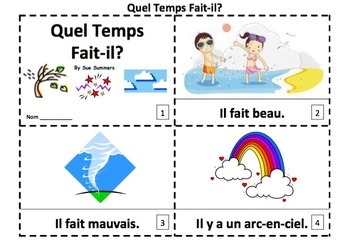 French Weather Version II - 2 Emergent Reader Booklets - Each booklet contains 8 pages: the title page with 7 additional pages containing common Spanish weather phrases. 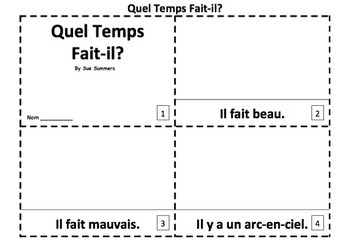 Sample phrases include il fait du brouillard, il y a des nuages, il y a du tonnerre, and il fait frais. Also included is a page of suggestions for using the booklets and an assembly instruction page. Students first read and cut out the booklet that contains text and illustrations, then create their own version using the text only template. Students will be proud of their creations and will have fun sharing them with classmates and family members! The illustration version can be projected in class to present, review and practice pronunciation of the weather phrases. The text only version can be projected onto the Smart Board and students can draw pictures on the Smart Board that correspond to the text. Please click here to see more of my French emergent readers. Please click here to see more of my French weather materials.